According to Centers for Disease Control (CDC), one in four Americans over 65 years of age experience falls on an annual basis. Falls like these account for at least 70 percent of accidental deaths in elderly populations in the United States. By these statistics, an estimated 12 million seniors are to experience a fall in the coming year—and one out of five of these incidents is likely to lead to hospitalization. This is where fall alert systems for seniors come to play. i) A loud tone of a siren plays on the phone, alerting people around that something is amiss. ii) Automatic call made to the pre-fed number(s). iii) Fall alert messages to pre-fed phone numbers and emails. In many apps, this is accompanied with GPS location due to which help can be provided quickly and help prevent serious complications due the absence of immediate help. 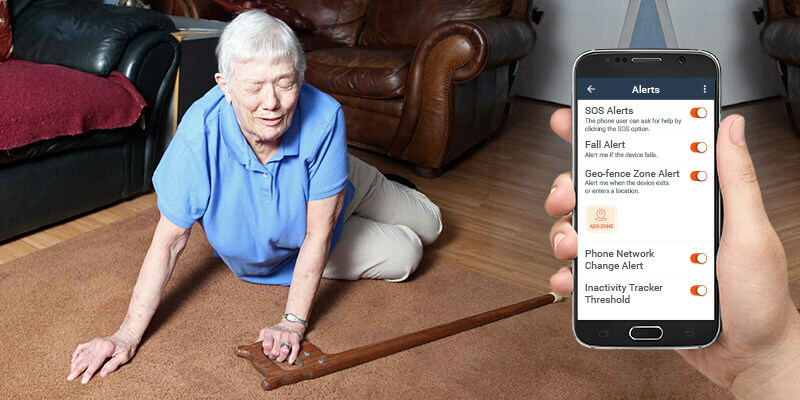 This automatic fall detection technology in apps for elderly emergency addresses the issue of users being unable to call for help during a fall, which can significantly help reduce mortality rates from falls. Emergency call button for elderly or Rapid emergency help buttons: As detailed above, these features in a senior alert system get activated in the event of a fall and calls the pre-fed number automatically. Many medical alert system for the elderly also configure the app such way that the app is always there on the screen in the form of an icon which just has to be clicked once to activate all the above features. This way, the senior can get help easily at all times, irrespective of the situation. Such medical alert systems are often low cost or even free and thus, there can be no reason why this should not be a part of your senior’s life. In order to effectively care for your senior, you should also visit their physician to know exactly why frequent falls are occurring. Whether it be their failing knees, poor eyesight, or lack of balance, that is to blame, remember that falls are in no way normal and may represent some underlying health condition that requires further investigation. This will help you determine their risk factors along with other possible causes of their frequent falls, in turn allowing you to take proper action, safety precautions, and treatment to avoid future incidents.